My son is a huge fan of breakfast food and this is one of his favorites. The recipe is adapted from one my son found this summer on You Tube (Vlog after College, not a food blog). We have since made it several times, or I should say my son has made it several times. It is super easy to make and great for breakfast, brunch, lunch or even dinner. In fact, it is a fabulous meal prep idea because it keeps in the refrigerator for a few days and heats up well. 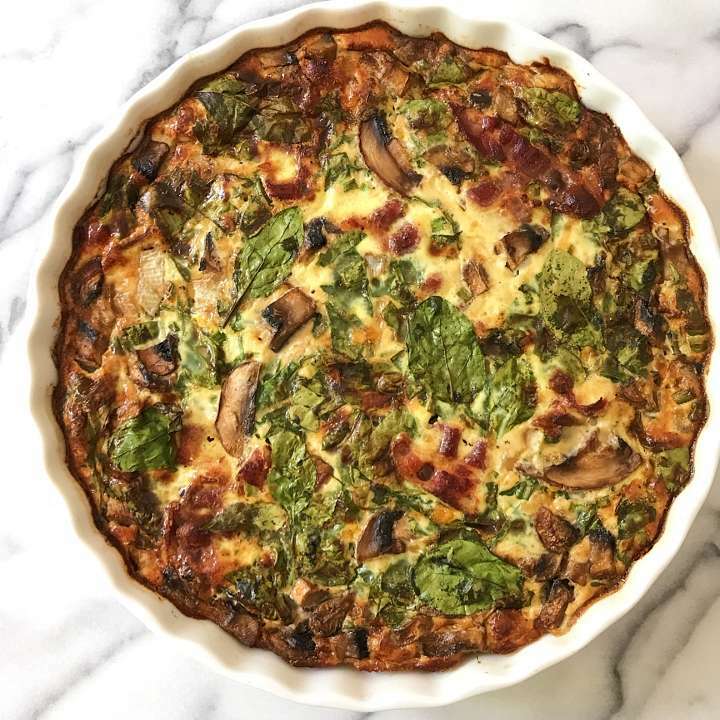 Made with the requisite cream, eggs and cheese, it’s also packed with spinach, onions, mushrooms, chives and thyme. The thing my son likes best is that it’s also made with bacon which provides lots of savory flavor. We’ve only made it crustless as that is how my son likes it, but you could also make it in a gluten-free crust if desired. 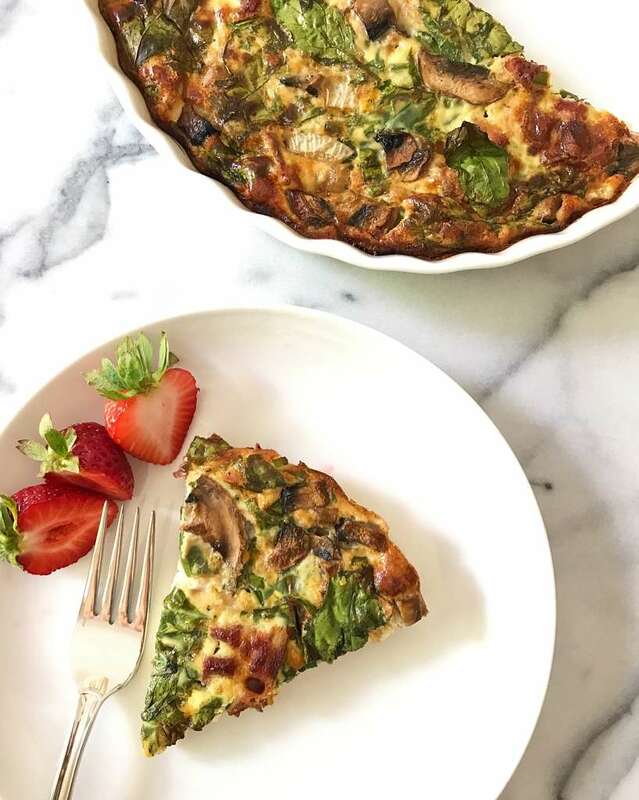 This crustless quiche is savory, flavorful and packed with vegetables Super easy to prep, it is perfect made-ahead and heated up on busy days for breakfast, lunch or dinner or served to guests for brunch. Recipe adapted from Vlog After College. In large saucepan over medium heat, cook bacon strips. In the same saucepan, using the bacon oil, saute the onions. After about 5 minutes, add in the mushrooms. Continue to heat, stirring gently until onions translucent and mushrooms tender. Remove from heat and place on same plate as bacon. Meanwhile in a large mixing bowl, add eggs and whisk to combine. Add half & half and milk whisk to combine. Add cheese, spinach, chives and thyme, mix together to combine. Pour the egg & spinach mixture over the bacon, mushrooms and onions in the pie pan. Bake at 425 degrees for 25-30 minutes or until top slightly browned and toothpick comes cleanly out of center.